Ian Fleming's classic Bentley is expected to bring in millions in an auction reports ctvnews.ca. 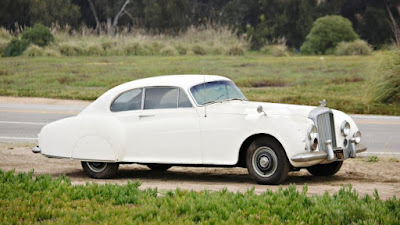 A 1953 Bentley R-Type Continental Fastback once owned by Ian Fleming could start a bidding war at this year's Gooding1 Company Pebble Beach auction on August 15. With its displays of incredibly exotic, incredibly expensive classic cars, its fine dining, stunning Californian scenery and high society clientele, the Pebble Beach Concours d'Elegance is already a very good setting for a scene in a James Bond novel. But the announcement that one of the potential star lots at this year's classic car auction has a big Bond connection has changed things up a gear. The lot in question is a 1953 Bentley R-Type Continental Fastback that is completely unrestored having been left to sit in a Hollywood garage for the last 30 years. Classic Bentleys have been climbing in price in recent years and there's little doubt that the R-Type Continental is one of the finest and most desirable grand tourers ever built by the company. However, despite its unrestored state, there's every chance that this car could fetch $2 million when it goes under the hammer in August. And that's because it used to belong to none other than Ian Fleming.